Developed to inform the 2013 National Climate Assessment, and a landmark study in terms of its breadth and depth of coverage and conducted under the auspices of the U.S. Global Change Research Program, Coastal Impacts, Adaptation, and Vulnerabilities examines the known effects and relationships of climate change variables on the coasts of the U.S. This state of the art assessment comes from a broad range of experts in academia, private industry, state and local governments, NGOs, professional societies, and impacted communities. 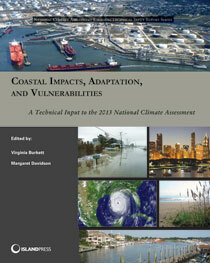 It includes case studies on topics such as adaptive capacity; climate change effects on. It highlights past climate trends, projected climate change and vulnerabilities, and impacts to specific sectors. Rich in science and case studies, it examines the latest climate change impacts, scenarios, vulnerabilities, and adaptive capacity for nine major coastal regions of the United States and provides essential guidance for decision-makers – as well as environmental academics, professionals, and advocates – who seek to better understand how climate variability and change impact the US coasts and its communities.